Here are some photographs and information on the common skin types. This information is not enough to exclude skin cancer with a self-check or home examination - some of the skin cancers have multiple presentations, and some of the rarer but dangerous skin cancers are not shown here. If in doubt please arrange a professional skin check. Basal Cell Skin Cancer is the most common skin cancer in Australia and usually the least dangerous, assuming it is dealt with promptly and appropriately. BCC often presents as a pearly pink bump or as a flat area of reddish or altered skin on the trunk. If left untreated for a long time these lesions can erode underlying muscle, bone, nerves or other nearby structures. Although rarely fatal BCC can be very destructive. It is very common for BCC skin cancer to bleed spontaneously or with minimal trauma - any such bleeding lesion must be viewed with suspicion. Most BCC is linked to long term sun exposure. Squamous Cell Cancer can present as a red or scaly plaque on the skin, these can be tender and sore sometimes. These are more dangerous than BCC and can spread / metastasize around the body. SCC kills 400 Australians every year. SCC skin cancer is usually treated surgically, though radiotherapy is sometimes used in certain cases. Like BCC, SCC is also linked to long term sun exposure, but can also be caused by exposure to the UV radiation of welding arcs. SCC is also more common for patients on long term immune system suppressing medication, eg organ transplant recipients. Also known as 'Bowen's disease' this is a milder form of SCC that is limited to the surface, and has not become invasive - yet. Bowen's disease can sometimes be present for years before becoming invasive. Bowen's disease often looks like a red, scaly plaque on the skin. Although surgery is an effective treatment, there are other less invasive treatments for this common skin cancer, including prescription creams. Melanoma accounts for 4% of Australian skin cancers, but causes the majority of the deaths from skin cancer, over 1600 Australians a year. Some melanomas may have variable colours throughout the lesion, they may look irregular and chaotic. Melanoma is the most common cause of death from cancer in the 15-45 year age group. 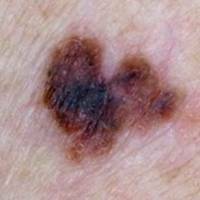 Melanoma can arise in pre-existing moles, but most new melanomas occur on normal skin. The risk of developing melanoma appears to be increased by a history of sporadic sun burn, but melanomas can appear anywhere, not just sun exposed areas. Solar Keratoses or 'sunspots'; are damaged areas of skin that have not yet become skin cancer, but given time might eventually become cancerous. They are termed pre-malignant lesions. It is normal practice to treat these pre-malignant skin areas if possible, reducing the risk of future skin cancer. Treatment of sunspots is normally non-surgical: freezing ie cryotherapy or prescription creams are common treatments for sunspots. These are scaly lesions that may appear 'stuck on' to the skin surface and may be crumbly, itchy and tend to slowly darken over time. They are genetic / inherited; there are not sun-related and they are not generally dangerous but can be annoying or unslightly. The majority of Australians will get some of these during their liftime, often appearing from middle age onwards. 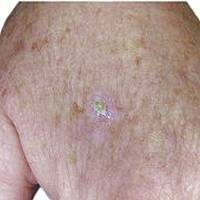 These lesions tend to start as skin coloured or light brown lesions, but often become darker over time. 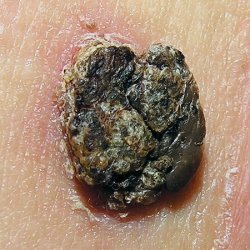 Other terms for these lesions include 'senile warts' or 'seborrhoeic warts' but they are not related to common/viral warts. These are usually treated by non-surgical methods, if treatment if requested. Harmless moles can be light brown, dark brown or very dark and they can be raised or flat. 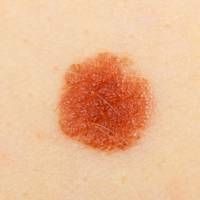 Benign moles tend to be of uniform colour, and tend to have round, smooth edges whereas melanomas can be irregular and chaotic. However, any mole which is changing, bleeding or has become irregular in shape should be checked by a professional with skin cancer training, and a suitable biopsy should be seriously considered. Some moles are present for life, but we do also gain and lose moles during our lifetime. People with darker skin tones tend to have darker moles than people with lighter skin. 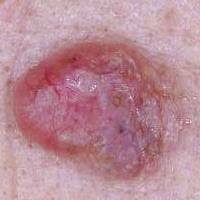 The most dangerous form of melanoma: nodular melanoma is usually a smooth, firm, growing bump. It can be darkly pigmented or just skin coloured (amelanotic). Nodular melanoma is highly dangerous as it tends to invade inwards more than grow across the skin.